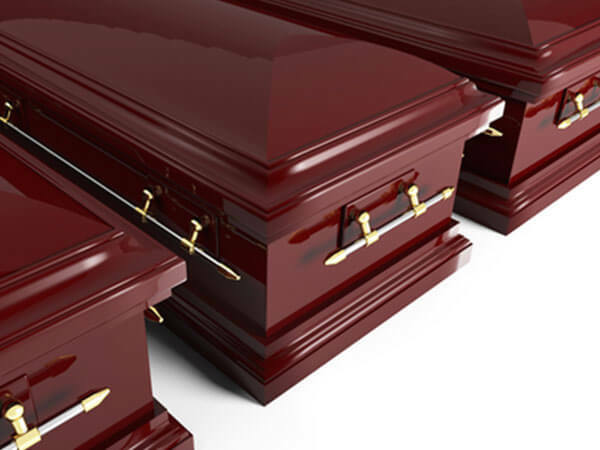 Casket Types - We provide many casket styles and finishes to suit every need. There are different gauges of metal featuring, either a single finish, or a two-tone blended finish. We also offer many wood varieties and shades of finish. And for those who prefer something completely different, we offer caskets with a scene painted on the outside depicting a service career, such as veteran, firefighter, or even a peaceful forest scene. Caskets may feature a sealing device for added protection from the elements, a small drawer for keepsakes, changeable inside panels, or even camouflage lining! The choices are endless. Keepsakes - We offer many types of keepsakes including cremation keepsakes, portraits made from remains, candles, pendants, and Thumbies*. Thumbies are jewelry designs which feature a thumbprint taken from the deceased, and come in many styles. Thumbies are a wonderful jewelry item for children, grandchildren, and close family members. Thumbies are even offered for pet lovers who have lost their companion. Monuments - The newest feature in our product line is a choice of monuments. There are many styles and sizes to choose from, either with or without vases. These monuments are a perfect tribute for lasting memory of your loved one. Urns - Urns are vessels which seal and hold the cremated remains of a loved one. They come in traditional vase-like shapes, square wood or marble shapes, desktop styles, styles which look like bookends, small ones to divide remains among family members, tiny ones to wear as jewelry, and many more. Urns are a wonderful way to hold your loved one dear, providing peace and comfort to the living. Printed Materials - Families may choose from a large selection of printed materials featuring register books, memory cards, laminated obituaries, bookmarks, thank you cards, and many more. DVD Slideshow - In addition to the glass-top photo table, families may also choose a DVD slideshow, featuring 50 to 60 photographs of their loved ones, set to their choice of music. It is a perfect, lasting tribute to the life of their departed. Audio or Video Recording of Services - Families often find that an audio or a video recording of the service helps provide comfort during the difficult times after the funeral. We will gladly record the service for you, providing CDs or DVDs to as many familiy members as you choose. *Thumbies is a registered trademark.